Kiss have announced the End Of The Road farewell world tour. 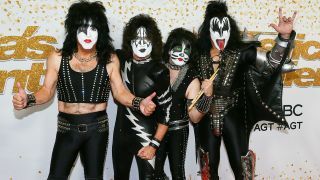 The band made the announcement during their appearance on last night’s season finale of America’s Got Talent, where they performed their classic track Detroit Rock City live. Speaking on the show, vocalist and guitarist Paul Stanley said (via HenneMusic): “This is going to be our last tour. It will be the most explosive, biggest show we’ve ever done. The band later issued a statement about their farewell tour, which reads: “All that we have built and all that we have conquered over the past four decades could never have happened without the millions of people worldwide who've filled clubs, arenas and stadiums over those years. Further details will be revealed in due course. Watch their performance from last night’s show below. He told Glasgow Live: “We’re not going to be able to do this into our 70s – and I’m 67 now. But we’ll do it for a few more years, and when we think it’s time to go, we’ll go.